Feb 17, 2013- At 5:35 hrs the Schuylkill Haven Fire department was dispatched to Rt 61 S/18 University for a pedestrian struck Units arrived & set up a LZ for air medical & provided lighting & assisted with traffic control. Units were on scene for 3 hrs Chief 724 had Command. Feb 13 2013- 15:11- Stations 1 & 4 were dispatched to the area of 2 west Main Street for an MVA with fluids down. Crews arrived on scene and applied floor dry and stood by until the towing company arrived. Chief 730 had command and units were on scene for less then 30 mins. 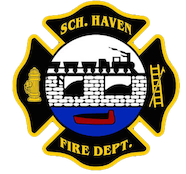 Feb 12, 2013- At 10:57 hrs the Schuylkill Haven Fire department was dispatched to the 15 Saint Charles St. in the borough for a reported Structure Fire. Units arrived on scene found an apartment filled with smoke from a self cleaning oven.Units vented and units cleared in 20 minutes Chief 730 had Command. Feb 3 2013- 17:18- The Schuylkill Haven Fire Department was dispatched to the area of 688 Berne Drive for an MVA . Crews were cancelled en route. Chief 723 had command. Feb 2,2013- 21:00hrs- As members of Station 4 were setting up from their monthly Chicken Pot-Pie Dinner a neighbor came to the firehouse looking for assistance in lifting. A crew of 5 walked over to the house and assisted the woman, Units were on scene for approx 5 minutes. Chief 735 had “Command”. January 31, 2013 – Just after returning from the previous RIT Call, Station 4 was dispatched along with Fire Districts 56,47,42, and Ladder 725 to 231 East Independence Street for a house fire. Chief 56-01 arrived on scene and was met with a visible smoke condition. The cause of the smoke was determined to be a malfunctioning oil burner inside the residence. Crews from Station 4 checked for any extension and assisted with ventilation. All units were then placed clear and available by Chief 56-01 (Zimmerman). E-737, W-736, and S-739 responded. January 31, 2013 – At 15:51 the Schuylkill Haven Rapid Intervention Team (RIT ) was dispatched to 2 Wiggen Street, New Philadelphia for smoke in a house. As personnel and units E-732 and Squad 739 arrived on scene, Chief 54 placed RIT available. Chief 730 had command. January 24, 2013 – at 02:02 Station 4 was dispatched for E-737 as part as a mutual aid response to 342 Pawnee Drive, Wayne Township for a carbon monoxide investigation inside a residence. Just as E-737 was ready to respond, the call was cancelled by Chief 34-05. January 23, 2013 – At 13:43 Station 4 was dispatched along with Fire Districts 56 (Orwigsburg) and 47 (Landingville) to 921 W. Market Street, North Manheim Township for an automatic fire alarm. Crews arrived on scene and found an issue with the sprinkler system. Fire personnel located the problem and deactivated the system. All units were then placed clear and available. Jan 10, 2013- 14:04hrs- Fire District 34 Stations 1(Freidensburg) and 2(Summit Station) along with Rainbow for the Rescue were dispatched to the Intersection of Rt.183 and Rt.443 for a Motor vehicle Accident with Entrapment. Chief 730 and Rescue 726 went responding minutes after dispatch arriving on scene quickly to find a 3 car MVA with 1 pt trapped in the vehicle. Crews from Haven quickly went to work as the rest of the units arrived on scene and grabbed tools as well. Crews worked quickly to free the trapped Patient and assisted the Medics with packing and loading into the waiting Ambulance. Crews were on scene for approx 1.5hrs. Chief 730 had Command.